The building, a tavern, restaurant, like none other, was located a couple of miles north in Daphne, Alabama. While at Art shows and Festivals, I would ask locals, what they had in the area that was nostalgic. I got all kinds of answers. After writing them all down, I took a tour of the area before leaving, taking photos of the places on my list. The next year, I would return with a painting from their local town, one they can identify with, so they can buy prints of the painting, or even the original painting. 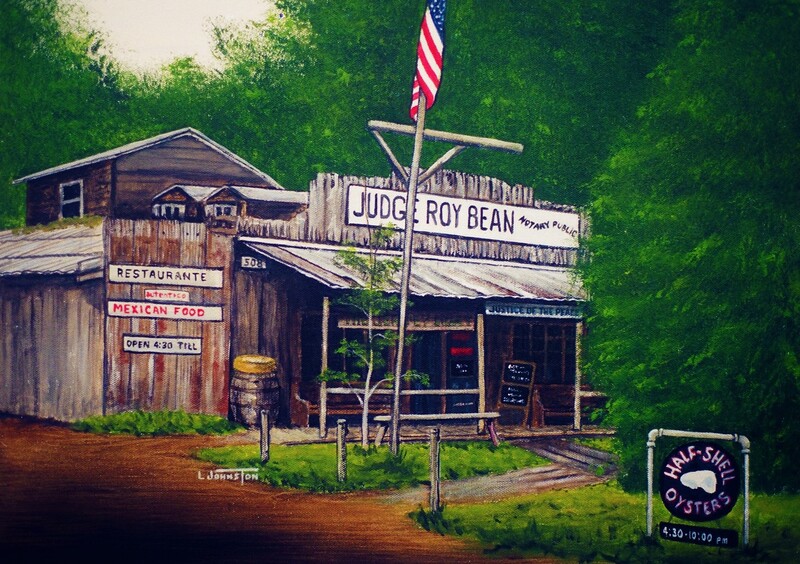 Judge Roy bean, was a famous Judge, which they named the place after. As you can see, the outside does not have the curb appeal, we are looking for, when trying to sell a home. There were beer bottles on the bench outside, and the place looked abandoned……… I was wrong. Inside was a bar, with a small stage and quaint places to sit. Then, you stepped down, out another door that lead into a fenced area with gazebos, volleyball courts, and yes, even a place to have concerts. I have been told that Jimmy Buffet and Alabama played there at least once. It was not unusual to see BMW’s, Cadillacs and even Limousines parked outside, when they were open. Since then, the building burned down and as far as I know, it was never rebuilt. I believe it was the owner of the restautant, who bought the original painting.